The new Women’s Bantamweight Champion of the World will make a quick return to the octagon when she faces #4 ranked Amanda “Lioness” Nunes. The match-up is an intriguing one. Miesha “Cupcake” Tate last fought on the extremely successful UFC 196 card along side Conor McGregor and Nate Diaz. On that night, March 5th, 2016, Tate stopped then Champion Holly Holm in the final round with a textbook RNC. Just five months later, on July 9th, 2016, “Cupcake” will attempt to defend her belt against the streaking Nunes. The first thing that stands out in this match-up is the discrepancy in drawing power. Nunes simply doesn’t have the exposure and name recognition that is required to sell tickets and PayPerViews – though she does deserve a title shot. Apart from the obvious stylistic differences, experience and training, the financial aspect of this fight and future ones to come should be considered. Tate took home 92k USD at UFC 196, Holm got 500k. The major consequence we have to examine is what would happen if the belt changed hands at UFC 200.The top two contenders in the talent-rich Women’s Bantamweight division, Holly Holm and “Rowdy” Ronda Rousey have absolutely no relationship with Nunes. While Nunes vs. Rousey might sell simply because it would be the return of Rousey, that prospective fight wouldn’t be able to touch Tate vs. Rousey 3 or Tate vs. Holm 2. With this match-up, the UFC has put Tate, but also themselves in a very hard place. A loss could mean the difference between renewed interest and financial success, and a division with a relatively unknown champion. The reason we need to examine this hypothetical situation is being Nunes is an extremely live underdog coming into this bout. She has one-punch knockout power, owns nine KOs/TKOs, is on a three-fight win streak and trains with one of the best camps at American Top Team (ATT). The “Lioness” has a real shot at upsetting the champion and maiming the UFC’s plan for the Women’s Bantamweight division. That begs the question: With so much relying on Tate remaining the Bantamweight Queen, why was this fight made at all? Best-dressed stand-off since the Aldo-McGregor love fest. UFC 200 was originally scheduled to feature the rematch between Nate Diaz and Conor McGregor (their first fight was also at UFC 196). Tate was already slated to fight on that 200 card but it is obvious that matchmakers weren’t thrilled at the prospect of regurgitating the main and co-main events just a few months later. With Rousey out of the picture, Holm was the best choice of opponent. She has star power, is ranked #1, and most importantly: she has a relationship with the two biggest draws at 135 lbs. Tate vs. Holm 2 would have been a win-win for the UFC. Whoever would have came out on top would have sold exceptionally well against Rousey – who by all accounts will be receiving an immediate title-shot on her return. But UFC 200 wouldn’t be the historic and novel card it is had it shared the same four headliners of UFC 196. So the call went to Nunes who was deemed the next best thing. Now though, with a new main event, I am sure the UFC is less than thrilled when they look at the consequences for Tate vs. Nunes. Still, they can hardly cancel that bout and insert Holm last minute – though injuries do happen. At the time it was being put together, this fight was probably their best option, but they are incurring a lot of risk. With Holm and Rousey waiting in the wings, Tate and the UFC find themselves between a rock and a hard place. 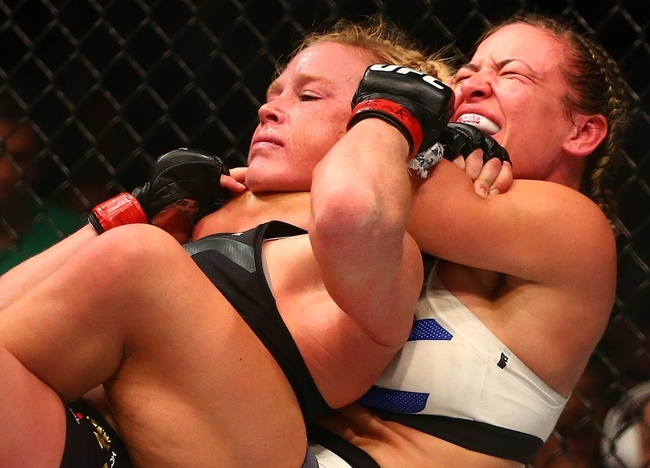 An upset win can mean the derailment of Women’s Bantamweight for the immediate future. But, lets not forget, the Fertitta brother’s (owners of Zuffa LLC) also own Station Casinos. They along with UFC brass are no strangers to gambling, odds, risks, and rewards. So while it may seem they stand to lose a great deal, perhaps the company, and certainly Tate herself, are confident in their ability to make smart bets and reap the rewards. Simon Says: Who’s got the Championship Mindset? Aldo, Holloway?